Gujarat budget papers released by the state government in the assembly on Tuesday suggest that while the “developmental” expenditure for the forthcoming financial year, 2018-19, would rise by just about 2.46% over the previous year, 2017-18, the “non-developmental” expenditure, on the other hand, would grow by a whopping 20.2%. If the budget papers are any guide, while making allocation for the developmental sector, the government has to set aside funds for such sectors like education, health, water supply and sanitation, welfare of scheduled castes and tribes, labour welfare, nutrition, agriculture and rural development, irrigation and flood control, energy, industry and mines and science and technology. On the other hand, the funds allocated for non-developmental sector go towards the payment of mainly interest on loans taken by the government, payment of public debts, pension and other retirement benefits, and so on. Interestingly, developmental expenditure is shown to have grown by a whopping 21.79% in the outgoing financial year, 2017-18 (as against 2.46% in the new financial year). 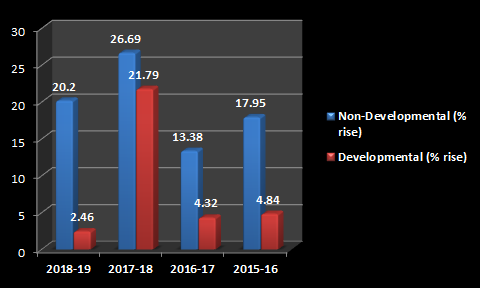 However, even here, in 2017-18, the non-developmental expenditure is expected to rise by an even proportion – 26.69%. The budget papers further show that the percentage growth in the funds available for developmental expenditure is the lowest in 2018-19 in four years. Thus, while it is estimated to grow by 21.79% in 2017-18, it rose by 4.32% in 2016-17, and 4.84% in 2015-16. This is against 26.69% rise in non-developmental expenditure in 2017-18, 13.38% in 2016-17 and 17.95% in 2015-16. The sharp deceleration in the growth of developmental expenditure comes amidst the Gujarat government’s budgetary papers claiming that they account for 61.06% of the total budget size – Rs 1,11,564.97 crore out of Rs 1,82,728.16 crore. Ironically, previous budgetary papers show that the deceleration in the proportion of allocation towards developmental expenditure began with the budget for 2017-18, which was presented in the state assembly a year ago. 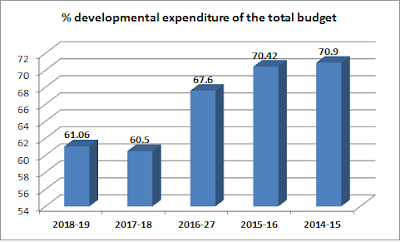 Thus, the developmental expenditure in 2017-18 is 60.50% of the total budget, almost equal to the budget for 2018-19, but it was 67.60% in 2016-17, 70.42%, 70.42% in 2015-16, and 70.90% in 2014-15. Notably, the Gujarat government, while calculating the developmental expenditure, does not just include allocation for making the socio-economic sector life of the people more robust than what it has been in Gujarat, considering the state’s poor rating in the social sector. It seeks to divide developmental expenditure under two heads – revenue and capital. As one financial analyst put it, an expenditure which neither creates assets nor reduces liability is called revenue expenditure”, and includes payment of salaries of employees and subsidies. These expenditures are financed out of revenue receipts, and are considered the first priority. As for capital expenditure it either creates an asset (e.g., school building) and purchase of land, buildings, machinery, investment in shares, loans by Central government to state government, and so on. In the state budget for 2018-19, while the revenue expenditure for the developmental sector is put at Rs 82,443.37 crore, on the capital side it is just 29,121.60 crore. Capital expenditure, which would show infrastructure development, physical or social, and is considered necessary for growth, forms only 26.01% of the total Rs 1,11,564.97 crore developmental expenditure. All BJP does is criticise and blame Congress. What about their own governance, or lack of it, notably in Gujarat? I am sure the same thing is going to happen in all the states they rule--just give them a couple of years more.